On a sunny summer day at the beach, nothing beats riding down sand-strewn beach roads on a beach cruiser bicycle. Catch the cooling beach breeze in your hair as you ride along, explore a new area of your beach town that you wouldn’t otherwise reach on foot, or skip the parking headache along the beachfront all by simply hopping on your beach cruiser. 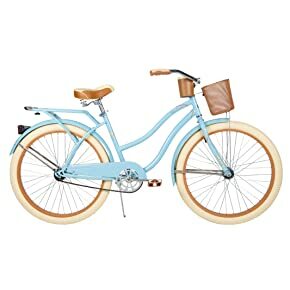 Best of all, you’ll also turn heads when you’re out for a ride thanks to the beautiful vintage design and sleek look of modern beach cruisers. Beach cruisers offer a number of advantages over traditional bikes. 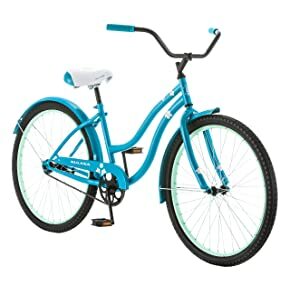 For the casual beachgoer simply looking for an easy way to get around, beach cruisers are perfect because of their long handlebars, plushy seats, and large wheelbases that all contribute to comfort during the ride. They also allow you to sit upright rather than hunched over as on a road bike, which is more comfortable for many users especially if riding with a backpack or bag to the beach. Beach cruisers are also easy to maintain and ride, since they often lack complicated multi-speed gear mechanisms. If you’re looking for a new beach cruiser for your next adventure at the shore, this guide of the best beach cruiser bikes offers everything you need to know to pick the right ride for you. 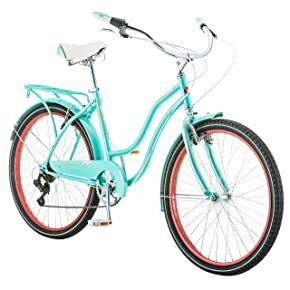 Although many cruiser bikes look the same when compared to a road or mountain bike, once you dive into the world of cruiser bikes you’ll quickly find that there are several different types available. This guide will primarily focus on beach cruisers, which are the most classic design. 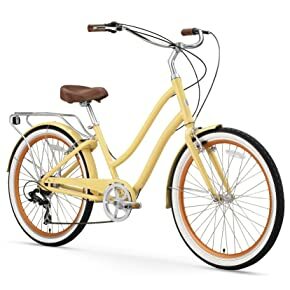 Beach cruisers are famous for their upright seating position, extra-large and comfortable seats, and extended handlebars. Most beach cruisers also incorporate large 26-inch wheels with fat tires, making it easier to speed over sand-covered roads. Stretch cruisers are very similar to classic beach cruisers, but take the elongated handlebars even further. This results in more of a reclined seating position than an upright one, which many riders enjoy for short trips between home and the beach. Similarly, low-rider cruisers are a variant of the traditional design that feature a shorter seat, similar to motorcycles. These cruisers place the handlebars nearly above your head, and special variants known as choppers even push the front wheel out at a 45 degree angle from the bike to truly mimic its namesake style of motorcycle. Single-speed vs. Multi-speed – Traditionally, beach cruisers were designed as single-speed bikes – that is, they don’t have any gearing to change the resistance in the pedal stroke. However, that’s begun to change in recent years and 3-speed and 7-speed variants are commonly produced by manufacturers. Having multiple gears can be great if you live in or visit a hilly beachside town, where you may want to shift up to pick up speed going downhill to the water or shift down trying to climb the hill back home – something that can be extremely strenuous with only a single gear. However, having gears also introduces the potential for having mechanical issues with your bike. Whereas single-speed bikes will almost never have issues with the chain or cassettes, multi-speed bikes can lose their chain or have other problems associated with shifting cables. If you go multi-speed, plan to either spend some time on bike maintenance periodically, or plan to bring the bike into a shop and pay for maintenance. Pedal Brakes vs. Handlebar Brakes – Most beach cruisers brake simply by pedaling backwards, a century-old technology known as coaster brakes. Coaster brakes are easy to use and many people appreciate the aesthetics of having clean-looking handlebars and not having to worry about maintaining brake cables. However, they can also be much more dangerous than handlebar brakes since coaster brakes necessarily depend on the force with which you push backwards, and lack the stopping power of handlebar brakes in any situation – in particular, when your chain drops coaster brakes will not work at all. That means that in a busy area, or one with a lot of hills, handlebar brakes can be lifesaving. Handlebar brakes are similarly easy for most people to use, but require adding handles and brake cables to your stylish bike’s handlebars and also require somewhat more maintenance. 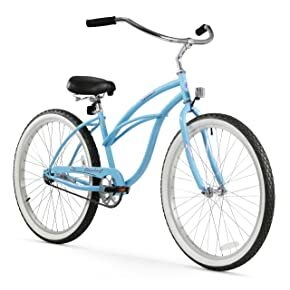 Fit and Comfort – Beach cruisers use a range of designs from the classic, upright beach cruiser, to frames more like the stretch and low-rider cruisers. The frame style that you choose depends, in part, on how you intend to use the bike. For riders who are as worried about style as they are the comfort of their ride, low-rider cruisers are unbeatable in the “cool” department. And, if you are interested only in taking the bike out for short rides around the beach, these bikes are plenty comfortable. 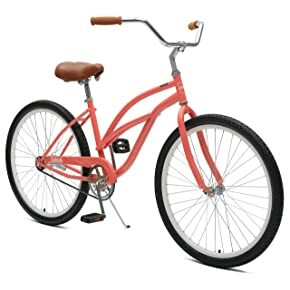 However, riders who see themselves taking the bike for the occasional longer, exploratory ride to a neighboring beach might favor the more upright position of a classic beach cruiser frame. The upright position allows you to relax your arms since you are not reaching up to the handlebars, as well as provides for a more efficient pedal stroke so that you are not wasting energy when out for a longer ride. Beach cruisers don’t get much simpler and easier to start riding than Firmstrong’s Urban Lady. This bicycle uses a traditional beach cruiser design and comes in two sizes that fit women ranging in height by nearly a foot, meaning it is easy to lend the bicycle to a friend. Thanks to the steel frame, the bicycle is heavy, but also extremely durable. The heavy frame is paired with thick, supple tires that provide for a smooth ride even over bumpy or cracked road. For the one- and three-speed models (a seven-speed is also available), the Urban Lady uses coaster brakes. The result is a clean-looking bicycle with no cables hanging off the handlebars. Another welcome feature of the bicycle is that is has a smooth steel guard over the chain, which prevents you from getting chain grease on your pants when pedaling. The only thing the bicycle lacks out of the box is a set of matching fenders to keep you dry and clean when the road is wet or sandy, although there are attachment points for fenders to be added later. 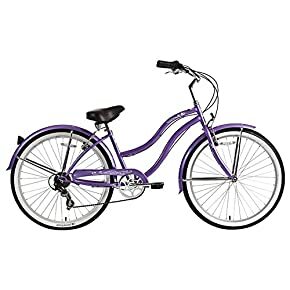 For those excited about looking good on a new bicycle, the single-speed version of the Lady Cruiser is available in 14 different colors. The designers of the EVRYjourney bicycle clearly built this ride with ease and comfort of use in mind, but they didn’t sacrifice on the bike’s good looks or ability to handle long rides. The signature feature of the EVRYjourney is its curved “step-through” frame design. The frame drops low just in front of the seat, making it easy to swing your leg over the frame to get on and off the bike and to stand over the bike when stopped. The bike’s geometry compensates for being low enough to the ground for you to stand when stopped by pushing the pedals forward on the frame, so that your legs can be fully extended when pedaling. The handlebars are also extended, so all of this adds up to a comfortable upright seating position that won’t leave your back hurting. The seven-speed version of the EVRYjourney (it is also available as a one-speed, three-speed, or 21-speed) is simple to shift and incorporates handlebar brakes, which are much better than coaster brakes for stopping in high-traffic areas or on hills. Small additional features, like a built-in kickstand, an included rear bag carry cage, and matching front and rear fenders, add serious style and utility to this bicycle right out of the box. Critical Cycles took a “less is more” approach to the Chatham bicycle, and it pays off in the bike’s sleek and smooth ride. The single-speed version (three- and seven-speed versions are also available) is extremely clean, with no cables emanating from the handlebars and a steel guard over the chain to prevent catching your pants when pedaling. The bicycle also adds comfort by incorporating a plush, extra-wide seat – the faux-leather look of which adds even more style to the overall look of the bicycle – and extra-wide pedals. The frame incorporates a step-through drop in front of the seat, making it easier to stand over the bike when stopped. However, the drop is not as severe as on the Sixthreezero EVRYjourney so that the rest of the bike geometry doesn’t need to compensate – the pedals are still under you rather than pushed forward, as you would expect for a traditional beach cruiser. Lastly, the steel frame and double-walled wheels make the bike extremely durable and flat-resistant, so you can spend more time riding and less time working on maintenance. The only downside to this bicycle is that it was designed with minimalism in mind – there are no included fenders or carry racks, and the only accessory included out of the box is a kickstand. The Nel Lusso from well-established bicycle company Huffy comes well-equipped with nearly all the accessories you could want right out of the box. The frame includes matching fenders, a rear light, a rear bag carry cage, a kickstand, a basket on the front, and even a stylish-looking cupholder on the handlebars! Top that off with an embroidered seat, and the fact that this bike comes almost fully assembled out of the box (which is not the case for most bicycles on this list), and you’ll be ready to ride anywhere within minutes of receiving this bicycle. The only downside is paying for accessories you might not need, although everything included except perhaps the cupholder is high on the list of useful add-ons for beach cruisers. The bicycle itself is a single-speed with coaster brakes, so it does not get much easier to operate and paired with all of the included carry options is perfect for riding around town for errands. The ride itself is nothing to scoff at, either. The frame features a step-through curve similar to the Critical Cycles Chatham, keeping the pedals underneath you in a comfortable upright riding position. The steel frame and thick, double-wall wheels make for an extremely smooth ride. If you’re looking for a low-budget bicycle cruiser – maybe something to use once for a summer rental at the beach, or you’re just not sure if biking is for you – Kulana’s cruiser bicycle is perfect. This low-cost bike has many of the same features as the more expensive bicycles on this list, with the caveat that the individual parts on the Kulana are more cheaply manufactured and will not last as long as for other bikes. That said, the Kulana is clean and easy to ride, designed only as a single-speed with coaster brakes. The frame is heavy steel, which makes for a smooth ride, although the wheels are of lower quality than those found on other bikes so that rough road is more likely to result in a flat tire. The frame also features a step-through drop in front of the seat, similar to that found on the more expensive Critical Cycles and Huffy bicycle designs. However, the pedals are somewhat narrow and lack durability and the handlebars are a no-frills design with only minimal padding in the hand placements. The Kulana also comes with matching fenders and a kickstand, and leaving the durability issues aside this bicycle is well-equipped and comfortable enough for short rides around the beach. If you’re into longer rides or tackling a few hills in addition to easy trips around the beach, the Schwinn Perla is the bicycle for you. This bicycle is only available in a seven-speed version, and Schwinn has designed the bike around having far more versatility than its single-speed competitors. Perhaps the biggest divergence are the brakes: Schwinn added V-brakes to the front and rear wheels, which work similarly to the caliper brakes seen on most road bikes and have similar stopping power. That means you don’t have to worry about stopping distance when cruising downhill or in highly trafficked areas. In addition, the easy-to-turn twist shifter on the handlebar makes it simple to shift quickly when going up or downhill. Schwinn also didn’t compromise on comfort or the utility of the bicycle for riding around the beach. The frame incorporates a step-through drop in front of the seat to allow standing when stopped and to make it easy to get on and off the bike. The bicycle also includes front and rear fenders, as well as a rear bag carrying cage. For anyone who is willing to take on the added maintenance for a seven-speed bicycle, the Perla is an excellent and versatile choice. Jimmy Buffett fans, rejoice – there’s a bicycle to show off how much you wish it was 5 o’clock! 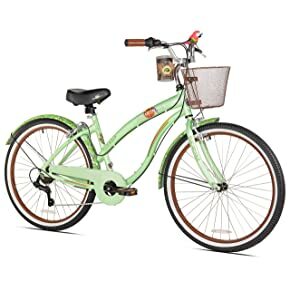 The Coast is Clear features the classic Margaritaville logo prominently on the bicycle (it is a sticker, but not removable without ruining the paint) as well as has the accompanying parrot emblazoned in the steel chain guard. Even more wildly, the bicycle comes with a plastic parrot attached to the handlebars! (This can be easily removed.) The bicycle itself is a seven-speed that in many ways echoes the design of the Schwinn Perla, incorporating a step-through drop in the frame, V-brakes, and front and rear fenders. However, the step-through frame does not drop as much as on other bikes, so only taller riders will be able to make use of this feature. One of the major differences between this bike and the Perla is that the Coast is Clear uses a lightweight aluminum frame. This means that the bike is significantly lighter, which can be extremely helpful on longer rides and when climbing hills, but the frame also does less to dampen bumps in the road. The aluminum frame, along with the Margaritaville branding, also contributes to the relatively high cost of this bicycle. The Pantera bicycle by Micargi is another seven-speed cruiser with a design that makes it highly versatile for everything from long, hilly rides to short and sweet trips around town. Shifting is extremely easy thanks to the twist shifter on the handlebar, and the handlebar brakes are cabled to V-brakes with road bike-worthy stopping power. The frame features a step-through drop that puts your feet slightly forward of the seat post, so that the riding position is extremely comfortable and won’t leave your legs feeling cramped during a long ride. Altogether, the bike makes it easy to stop and go in trafficked beach town roads or to find your rhythm going up and down rolling hills. The Pantera is also well-outfitted with accessories that allow you to ride anytime. The matching front and rear fenders will keep you dry when the roads are wet, and the bicycle comes with a rear light, front reflector, and reflectors in both wheels that are perfect for when you’re planning to be out riding late into summer evenings. The only downside to this bicycle is that if you’re really looking to tackle hills, which is where this bicycle excels relative to its competitors, the steel frame can still be quite sluggish due to its weight. Beach cruisers are making a tremendous comeback reminiscent of their heyday in the 1950’s, and with good reason. These bikes are extremely comfortable, stylish, and fun, and can quickly transform a day at the beach into an adventure. There are a huge number of options for different frame fits, gearing, and brake styles, but this guide breaks those differences down to help you choose the perfect beach cruiser for your next adventure. Plus, we’ve covered the eight best beach cruiser bikes for women to make the decision easy once you’ve identified the combination of features that are right for you. Next time you’re at the beach, hop on your new ride and take a spin around town!